The Sun Makers originally aired in 1977. Because my new little chum here seemed unhappy about something. The Sun Makers was reportedly written as a result of a disagreement between writer Robert Holmes and the British Revenue and Customs. That’s the oft-cited background to the story, so well known that it’s even included on the notes included in the DVD release. With that summary, you’d expect The Sun Makers to be a condemnation of the tax system, and a protest at the government’s funnelling off of money from the individual to pay like pesky things like roads or schools or hospitals. Instead, Holmes has crafted The Sun Makers as something altogether more compelling and instructive. 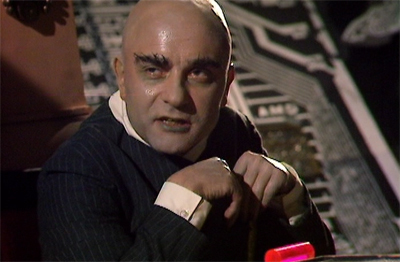 Rather pointedly, while The Sun Maker is a story about excessive taxation, the episode casts a large interstellar corporation as the villain of the piece. The episode’s primary antagonist isn’t a state official, it’s a single-minded number-crunching accountant who operates a large corporation that has managed to turn light itself into a financial commodity. This isn’t the story about individuals fighting for the right not to pay tax, it’s people fighting for decent working and living conditions. Indeed, it’s quite easy to read The Sun Makers as a rather socialist piece of Doctor Who, ending with the massive organisation of the working class to resist their greedy capitalist overlords. That’s quite a radical shift from the story you’d expect given the background. In that respect, it seems almost like a call-forward to the pointed subversive social commentary of the Cartmel and even Davies eras. Robert Holmes was a very cynical writer. It shines through a lot of his Doctor Who work. Holmes seemed to have very little faith in institutions or systems or societies. More often than not, these were just tools used to oppress individuals, and their influence ran deep and subversively. Holmes could be brutal when he wanted to be. 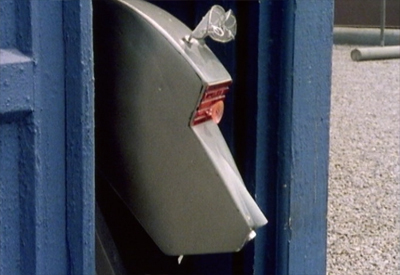 The Caves of Androzani depicts a society so corrupt that even the Doctor himself cannot save it. 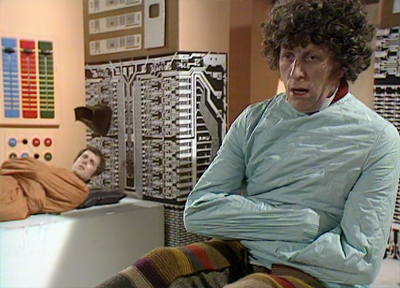 The Two Doctors seems to brutally critique Doctor Who‘s idea of monsters. And yet, despite all this, there’s also a sense that Holmes could be quite romantic when he wanted to be. Carnival of Monsters is the best story of the show’s tenth season, and it exists as an ode to how wonderfully crap Doctor Who could be, while arguing that it was still a universe of infinite possibilities. Holmes was capable of finding humanity and hope in the very darkest of places. While the high body count might lead it to be lumped together with the nihilism of the rest of the Saward era, The Caves of Androzani ends with the Doctor dying to save one live in what might be the Fifth Doctor’s finest moment. 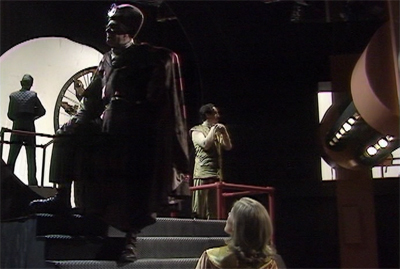 And here, in The Sun Makers, the Doctor arrives on Pluto and decides to bring the corporate government crashing down because that drove his “new little chum” to the point of suicide. That’s a very romantic depiction of the Doctor, on par with the Eleventh Doctor’s inability to ignore a child crying in The Beast Below. The Sun Makers is an ode to the idea of the Doctor as a man who cares about the individual enough to want to tear down any system that would push somebody that far. The Sun Makers is an incredibly romantic piece of Doctor Who, despite its oft-cited cynical origins. The Sun Makers is written as satire, but it feels quite astute in this era of debt culture. As much as the word “tax” might be used, it makes a lot more sense to imagine Cordo as the futuristic equivalent of a person drowning in negative equity, struggling to breath underneath the weight of the bills crushing down on him. The corporation itself is some vast nebulous organisation that has managed to reach a point where it has pushed a huge portion of the public into debt. “Then there’s the medical tax on Q-capsules, and work tax on extra hours, so I could never clear the debt,” Cordo explains, recounting how his father’s death pushed him into a debt that he is unlikely to escape. “You see, the Company charges fifty percent compound interest on unpaid taxes. I’m only a grade D work unit, three talmars a shift. Three talmars. That’s not enough.” When Leela is confused by all this sci-fi jargon, the Doctor neatly sums it up for her. “He can’t make ends meet.” That’s all you need to know. Of course, this deal is lost to history. When the Doctor asks the humans inhabiting Pluto, he discovers that nobody really has any knowledge of what is actually going on. They’ve all been kept in the dark and worked to the point of death. They don’t even know who they are working for. 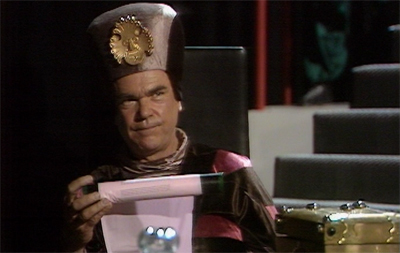 “What is this Company?” the Doctor demands on Mandrell and his rebels. “Can anyone tell me that?” Nobody can. “I mean, who runs it?” the Doctor asks. “What’s it for?” And then, finally, he gets an answer. “It makes a profit, that’s what it’s for.” And that would seem to be it. It’s a company that exists to generate money, with no regard for anything else. Not even its investors or some greater good. “But who gets the profit?” the Doctor presses. “Where does it go?” There’s no indication that anybody working for the company profits from the company’s good fortunes. Instead, it’s a large and terrifyingly vague entity that exists solely to make money. It seems that the company has found a way to turn light itself into a valuable commodity that can be bought and sold. As the title implies, one of the company’s business models involves the construction of artificial suns. There’s the suggestion that access to the light created by these suns has bee restricted – access to sunlight is a privilege of the higher class, and certainly not something that the working class need to be concerned about. 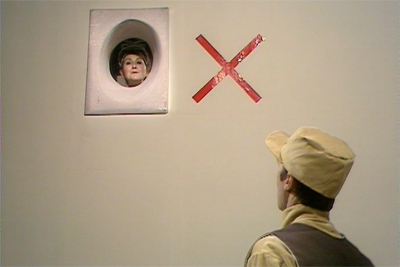 “It is an offence!” Cordo warns the Doctor. “Only the executive grade is allowed in the light of the suns.” Hiding in the darkness, under cover, Mandrell himself suggests that it’s possible for people to go their entire lives without experiencing direct sunlight. “Fool, there’s no light down here,” he protests. “Only that which we make ourselves.” It’s an absolutely terrifying thought, that a world could exist materialistic enough to commoditise sunlight itself. Then again, it’s worth noting that The Sun Makers was broadcast only a year after Perrier was first released. Although it wasn’t the first bottled water company in the world and the industry wouldn’t really take off until the mid-nineties, the launch of Perrier in 1976 is considered something of a turning point for the entire bottled water industry. As such, it’s not unreasonable to wonder whether Holmes was in some way inspired by the way that even water itself had become so highly commercialised. It’s wonderfully biting and scathing commentary, well-observed and seething with palpable anger. Here, Holmes seems as subversive or as cheeky as Cartmel or Davies ever were during their work on Doctor Who. 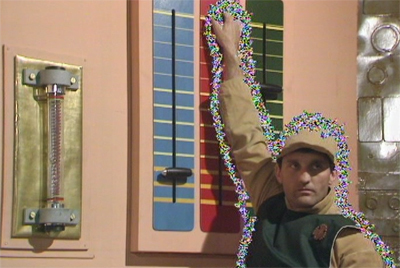 The Doctor essentially unionises the planet Pluto, inspiring the working class to fight for their fair share. “They’re not questions we’ve ever thought about,” Bisham reflects after the Doctor’s queries about the Company. “I mean there’s no answer.” The Doctor’s plan to defeat the Company hinges on the massive organisation of manpower, spreading the word and breaking down the tools of oppression used to keep mankind docile and dominated – chemicals in the air and propaganda on the media. The Doctor wins the day by spreading the idea of a workers’ revolt. “If the public video system announced there’d been a successful rebellion, think of the effect,” he urges Leela. “Everyone would believe it,” Leela responds. The very act of inspiring people to imagine a world that had escaped from under the oppressive thumb of the Company is enough to make that world so. The Doctor is able to inspire the people of Pluto to fashion their own better world. The Williams era has quite a few underrated gems, including this story. However, it’s also a wildly uneven period in the show’s history. It feels quite appropriate that the Williams era ended with an incomplete six-part Douglas Adams serial named Shada, serving as the ultimate demonstration of the era’s somewhat wasted potential. Still, there are moments when the promise of the Williams era shines through, and you can almost see how Williams and his script editors might have fashioned a consistent and impressive version of Doctor Who out of it. The Sun Makers is one such moment. It’s a very clever piece of writing, one that doesn’t rely on scares or violence or horror. Instead, it’s a very thoughtful piece of social commentary delivered with a wry grin and in a decidedly stylised science-fiction setting. The Sun Makers seems like it comes quite close to encapsulating everything that Doctor Who could want to be, if you were forced to cross “scary” or “tense” off the list. It’s worth noting that The Sun Makers looks astoundingly good. Barring a few of the gnaff special effects that one expects from Doctor Who, most of The Sun Makers benefits from wonderful location shooting. The corridor and roof scenes were all shot at the WD & HO Wills Tobacco Factory in Bristol, which gives the story a wonderful atmosphere. The corridors and surroundings feel suitably industrial, but they also look a lot more sturdy and impressive than the studio sets that the show typically used. During the Williams era, the show’s visual ambition often overreached its capacity by an even greater margin that usual. This isn’t normally a problem, if the story is strong enough to carry the audience along. Unfortunately, the Williams era would often rely so heavily on its production values that their failure often led to the failure of the story. So, in this, The Sun Makers remains quite an impressive production. 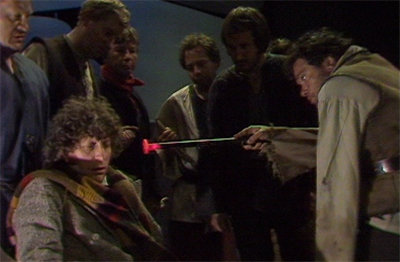 That The Sun Makers could be produced with this much skill and craft from so much of the same talent that produced The Talons of Weng-Chiang or The Brain of Morbius demonstrates just how flexible the format of Doctor Who is. More than that, though, it’s a rare moment of potential near the start of what will turn out to be a very uneven period in the show’s history. Looking at it, you can see how the Williams era could have worked as something other than a vastly uneven and inconsistent experiment. Sadly, The Sun Makers is the exception rather than the rule. It’s an example of clever and well-constructed Doctor Who that is drive more by wit than by tension. It also manages to cut pretty close to the heart of the character, offering the staggeringly optimistic depiction of the Doctor as a man who would tear down an entire government to save just one life from an uncaring system. That’s a pretty great definition of who the Doctor is.